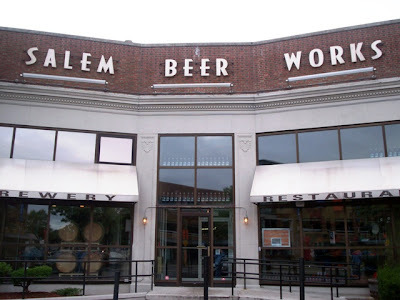 After a long day of sightseeing and museum visiting, Mom and I decided to have lunch at a highly recommended place - Salem Beer Works. Mom perused the menu prior to our visit, and everything sounded fantastic. We couldn't wait to go in. Luckily, I found a spot in their tiny lot. Although there are only about six parking spaces in the lot, there is a parking garage just across the street. Derby Street is very popular and highly traveled, so street parking is only for the lucky. When Mom and I went inside, there was a gift shop to our right that sold Beer Works T-shirts, and the brewery to our left. The Beer Works restaurants brew all their beer on site. It is also the oldest restaurant and brewery in Boston. As we walked to the front desk area at around 4:30 p.m., we were greeted by a friendly hostess. She grabbed two floppy, colorful menus and led us to a table both in front of the kitchen, and on the side of three plasma screen TVs underneath a very large witch decoration. We only had a few seconds to peek at the menu before being joined by Shannon, our waitress. She asked us if we'd ever been to Beer Works before. We told her no, and she proceeded to explain their brewing process. She also informed us of a special beer menu that was already on the table, and asked if we'd like a minute to decide what we wanted. Since I had already begun flipping open the beer menu, I quickly spotted what I wanted - a 16 oz. glass of Pumpkinhead Ale. Mom chose a Coke. Shannon left to retrieve our drinks while Mom and I looked over the food choices. Mom was later mad at herself for not spotting the Real City soda that was available in raspberry, black cherry, lemon lime, root beer, and birch beer in time. When Shannon came back with our drinks (in glasses), Mom and I were ready to order. Since we'd been walking for hours, we needed some protein. We both decided to go with a burger and fries combo. 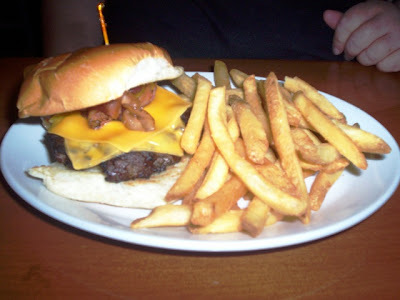 Mom chose the "Charlestown," which is a burger topped with bacon and cheddar cheese ($9.95), while I went with the "North End," which is a burger topped with red sauce, mozzarella cheese, and sauteed mushrooms ($9.95). We both ordered our burgers medium-well, and Shannon asked both of us if we would like lettuce, tomato, or pickles with our sandwiches. Mom said no, but I love pickles so I told Shannon to go ahead and add them. As she left with our menus, I decided to take a sip of my Pumpkinhead Ale ($4.50). It was great! I couldn't taste the pumpkin at first, but after I'd gulped it down I tasted a sweet mix of cinnamon, vanilla, and nutmeg. It was quite tasty, and actually a Beer Works favorite! They also have a Bunker Hill "Bluebeery" Ale that I was dying to try. Uninterested in beer, Mom's Coke tasted good, too. *Later I noticed a little tray going by with what looked like a sampler of four different beers (approximately 4 oz. glasses). I hadn't noticed that on the menu, and am definitely going to get one of those on my next visit. Salem Beer Works is your typical bar/pub/let's-watch-a-sports-game-on-their-flat-TVs kind of place. With pool tables in the back of the restaurant along with a little stage-type area, you could tell that this restaurant was equipped to have a lot of fun. The great part about Beer Works is that if the whole pool table scene isn't your thing, the dining room is located further away so that diners can eat in peace. Seating consists of tables and chairs, and against the wall there are long benches. Also, on good weather days, seating is available outside. The ceiling is open so that you can see all the industrial piping, and the walls are stained with a dark wood finish. The Beer Works colors seem to be orange and brown, which works great especially with the fall season approaching. 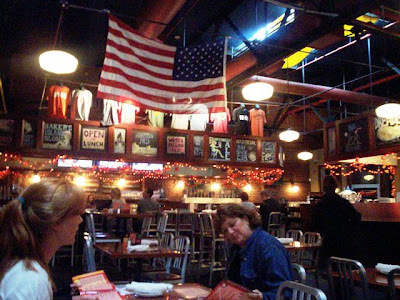 The bar is toward the center of the room and is surrounded by lighted fall leaves, colorful chalk message boards, a variety of Beer Works T-shirts, and topped off with a very large American flag. Also surrounded by chalk message boards is the kitchen, which we were facing. The boards described different menu items and beer choices, along with some cute drawings. There were no tablecloths, but there were cloth napkins. Both Mom and I thought the dining area was very clean and we enjoyed looking around at the decor. 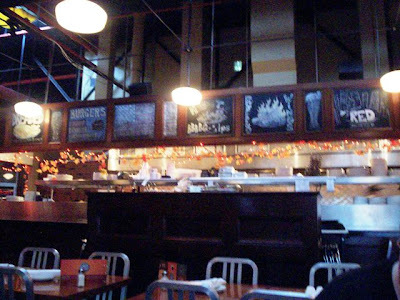 Specializing in bold American food, there is a lot to choose from at Salem Beer Works. From the different homemade beers to the delicious desserts, you can really go crazy here. Starters include the Boston clam chowder ($3.95 cup; $5.95 bowl), Beer Works sliders ($10.95), and the Mako shark skewers ($9.95), which is made from fresh Mako shark marinated in Beer Works "raspbeery" ale and grilled with tomatoes, onions, and served with jasmine rice and fruit salsa. You can order a Beer Works Bucket filled with things like beer battered o-rings ($6.95), jalapeno poppers ($6.95), and fried pickles ($6.50). You can also choose to get a bucket of fries. Beer Works offers both starter salads and dinner salads which you can order straight or vegetarian-style. All burgers are named after various areas in Boston, and for 95 cents you can add different toppings to your sandwich. The pizzas are all oven baked with hand-rolled dough and topped with fresh ingredients, and you can get them in both eight and 12 inch sizes. Choices include the BBQ chicken pizza ($7.95/$9.95) and the chicken and artichoke pizza ($8.95/$10.95), and you can add more toppings if you choose. There is also a lunch menu in addition to the regular which serves smaller versions of Beer Works favorites every day until 4 p.m., and a list of side dishes that include Beer Works sour cream and chive fries with ranch dressing, cornbread, and sweet potato fries with raspberry vinaigrette. Desserts include a creamy Oreo cheesecake ($6), the "Big Dig" brownie ($6), which is a huge chunk of brownie with vanilla bean ice cream, chocolate syrup, and candied pecans, and the Beer Works apple blueberry crumble ($6), which is layers of warm apple and blueberry crumble served with Herrell's vanilla bean ice cream, topped with whipped cream and served in a 16 oz. beer glass. Both chicken and speciality sandwiches are available like the New England lobster roll ($13.95), and the Nor'easter chicken sandwich ($9.95) topped with Canadian bacon and cheddar cheese. Every month, Beer Works offers fresh fish and meat specials served with vegetable and your choice of sides. To ensure the highest quality, these items will have limited availability and will require greater preparation time, and customers are asked to allow 20-25 minutes depending upon desired temperature. Two of this month's specials include the flat iron steak ($15.95) which is a 14 oz. grilled, marinated, flat iron steak topped with a roast tomato and avocado slices, and the red snapper ($16.95), which is a 10 oz. pan roasted red snapper, dusted and bronzed with Beer Works' house rub and served over a mixed berry coulis. 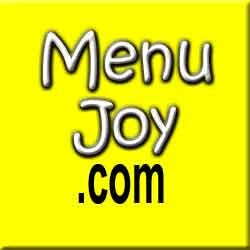 There are also suggested beers located nearby on the menu that would compliment these dishes. Finally, there are the "Beer Works Favorites," which include dishes like the sugarcane seared salmon ($13.95), BBQ'd baby back ribs (full rack - $16.95; half rack - $12.95), the Beer Works chicken penne ($10.95 - or $8.95 vegetarian), and the Rajun Cajun ($12.95 - or $10.95 vegetarian). This Beer Works' classic is a mix of sauteed shrimp, tasso ham, and chicken tossed with fresh tomatoes, peppers, and green onions in a slightly hot Southern-spiced sauce over jasmine rice. You really can't go wrong with any of these. It didn't take long before we spotted Shannon coming over with our dishes. Both burgers arrived steaming hot and looked and smelled delicious. Mom found her burger to be outstanding. She said that she could tell they used a good quality meat, and the bun was fresh and soft. The fries were also very tasty and her bacon topping was cooked perfectly. The melted cheddar complimented her burger, and she seemed to really enjoy her meal. My burger was fabulous. From the mozzarella cheese to the sauteed mushrooms, my pattie was also cooked perfectly. 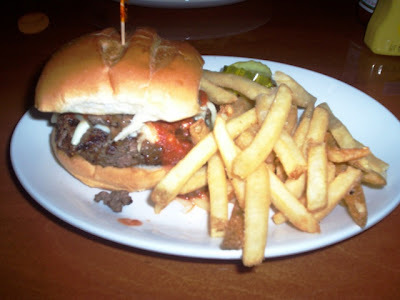 The fries were tasty, and the red sauce gave the burger a tangy twist. It reminded me of a chicken parmigiana dish, except without the chicken and with mushrooms. OK, maybe it wasn't exactly like a chicken parm, but it was still outstanding. My pickles were also very good. We left $33 on the table for Shannon as she was a great waitress and definitely earned her 20% tip. Both Mom and I wanted to use the ladies' room before the long drive back to Fall River, so we spotted a waitress in a black uniform (I think it is great that the waitstaff wears uniforms) and she directed us to the back of the restaurant. We walked past the pool tables and into the ladies' room. It was clean and organized. Mom and I left the restaurant at about 5:30 p.m.
My week-long birthday celebration has finally come to an end, and I'm glad that it ended with Salem Beer Works. From my Pumpkinhead Ale to the wonderful service, everything was a welcoming treat from a day of museum visiting and souvenir buying. We will definitely be back.